Does your data have a purpose? If not, you’re spinning your wheels. Here’s how to discover one and then translate it into action. getting dragged into the esoteric “weeds.” On one level, this is understandable. department, but throughout the organization where the insights will be used. boosts the odds of improving corporate performance through analytics. data points that help meet your specific purpose that have the most value. should be. Management has since begun to clarify its most pressing issues. But the world is rarely patient. times and, in turn, higher profits. later Burke took the gold; the time saved by his stance helped him do it. advantages are difficult to sustain. across bigger, multiple processes, the payoff can be exponential. The variety of stances among runners in the 100-meter sprint at the first Olympic Games, held in Athens, Greece, is surprising to the modern viewer. 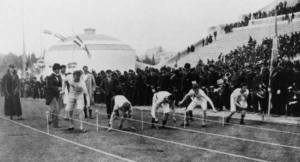 Thomas Burke (second from left) is the only runner in the crouched stance—considered best practice today—an advantage that helped him win one of his two gold medals at the Games. proof was in the eating—and in an improved P&L. together and transmit information across each stage in near real time. approaching 50 percent—hundreds of millions of dollars in all. mean it will move fastest today. and time its product launches accordingly. in isolation but fail to consider what different data sets convey in conjunction. the gullies among separate data sets. used a state-of-the-art machine that could undertake multiple processes. machines up and running was critical to the company’s success. had expected, and every hour of downtime affected the bottom line. the asset data meticulously, it could not find a credible cause for the breakdowns. create overwhelming complexity that actually inhibits the use of analytics. if the conclusions would work but sit unused, the analytics exercise has failed. new information more accurately and reacting to situations more quickly. 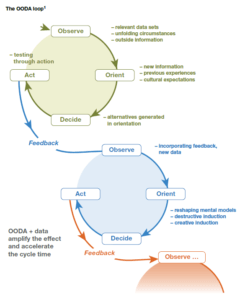 Observe, orient, decide, and act—a strategic decision-making model developed by US Air Force colonel John R. Boyd. more correctly—a dynamic series of loops (exhibit). Best-in-class organizations adopt this approach to their competitive advantage. deliver quick, largely self-funding results. and combine them in different ways. available; and making it possible to respond intelligently as events unfold. were intelligent and robust, and the answers were essentially correct. complicated and didn’t use it. like the iPhone or the Nest thermostat is making its way into the enterprise. clear and that draw users in. across your organization to do so—is essential. Analytics is a team sport. how to present the findings are matters of human judgment. and data analytics with business decisions and management. employees with quantitative backgrounds to join in-house analytics teams. produce insights that make sense, and are committed to real-world outcomes. insights—and to ensure that the insights are used. in the operating models of real-world processes and day-to-day work flows. I call it.” Data analytics ain’t nothin’ until you use it. mined, stellar analytics, and insightful conclusions on cross-selling opportunities. representatives kept closing the pop-up windows and ignoring the prompts. number and type of products they sold. market, and regulatory challenges that made any outcome uncertain. analytics to work for you.